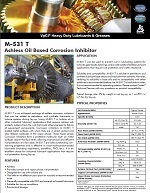 Description: M-531 T is an oil-based package of ash free corrosion inhibitors for petroleum and synthetic lubricants. M-531 T provides outstanding non-staining properties with excellent demulsibility and filterability. Package: M-531 T is available in 5 gallon (19 liter) plastic pails and 55 gallon (208 liter) metal drums. FEATURED IN: Cortec MCI-2012 IntegraPel Featured in Power Engineering Magazine! FEATURED IN: Cortec M-531 T Featured in Power Engineering Magazine! FEATURED IN: Cortec Unveils New Corrosion Inhibitor Featured in Machinery Lubrication Magazine!